If you are planning a special celebration in the heart of the city and want to stay in one of London’s best luxury five-star hotels we have some recommendations for you. Some you may have heard of before as their reputation certainly goes before them. However, others might not be so well-known. Nevertheless, all these hotels have 5-star ratings and will add an extra element of luxury to your trip. If you are looking for a great stay in one of London’s best luxury five-star hotels, here are our favourites. The first thing you will notice as your taxi pulls up to this hotel is the mind-blowing façade. This lights up at nights in different colours and dominates the road. The minute you step through the arched doorway you feel as if you are in a different world. The magnificent architecture has been restored and you can see original artwork and fleur-de-lys wallpaper. The rooms have impossibly tall ceilings and there’s also a subterranean spa, which people book months in advance. Expect to pay around £200 for a room. When you think of Claridge’s afternoon tea springs to mind, with delicate little sandwiches and delightful cakes on a stand complete with pots of tea. This hotel has so much more to offer, however, with modern luxury hand-in-hand with stunning Victorian architecture. The service at Claridge’s is world-renowned and there is also a discreet bar where celebrities like to hang out, so if you love a bit of star-spotting, this is the place to hole up. Expect to pay around £500 for a room. 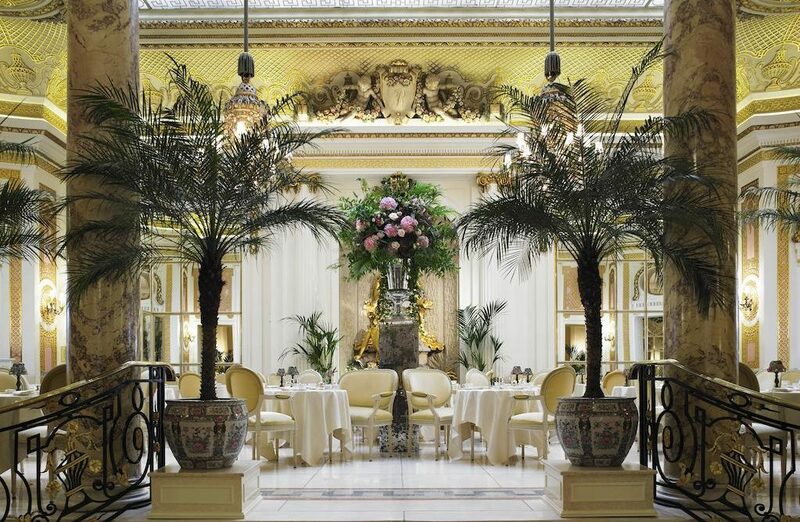 If you ever wanted to see how the rich and famous live their lives, then a stay at the Ritz will leave you in no doubt. There is so much to recommend about this hotel, from the jaw-dropping luxurious suites and rooms to the Michelin-starred restaurant. You get a wonderful sense of stepping back in time when you enter through the lobby doors. Customers have reviewed a night at the Ritz as ‘truly magical’, ‘a once in a lifetime experience’ and ‘old school manners in a stunning location’. If stunning views are what you came to London to see then you must stay at the Shangri-La Hotel. This is because you’ll find the hotel high up on floors 34-52. If you get good weather you can pretty much see the whole of the city. The north-facing rooms that offer these views are more expensive, however. The rooms here have floor-to-ceiling glass that gives an added wow factor to this hotel that others do not have. There is an under-stated Oriental elegance about the place that gives the whole hotel a sense of quiet calm and luxury. Expect to pay around £400 for a room. 1920’s glamour is the inspiration for the Mondrian. You certainly get a sense of this as soon as you walk in. There are so many options for how you want to spend your time here. There are rooms, suites and even 1-2 bed apartments where you can bed down for the night. It is undoubtedly the interiors that take centre stage here, thanks to the head of design at Habitat – Tom Dixon. The colours used in this hotel are bright. Not only that but you can also see touches of copper throughout the building. These give a nod to the building’s nautical heritage. If that doesn’t tempt you there’s also a 56-seat cinema and Rumpus – the rooftop club. Expect to pay from £149 a room.